As I sat down today to whip out some words of wisdom or jest about the outdoors I started a search in one of my reference files which contains all sort of information that I have gathered over the years. My reference files are full of stories and notes that I have gathered in my life that I have heard or lived and I was looking for something to give me a jump start. As I cruised through the electronic script on feral hogs I unexpectedly came upon one saying that I had apparently misfiled that was out of step with the subject of feral animals but struck me as funny and maybe it does fit with feral animals. Anyway as I slipped off into government from feral hogs one can see how there could possibly be a connection of some kind. I bring up feral hogs because they are unpredictable if you come face to face with them in the wilds and a drove, or herd, may turn and run at the first smell or sight of man or they may just decide to run over to you and see what you taste like. Let me give you a little background about these animals and do not ever forget the old saying about the guy who went to the outhouse and the hogs got him and that referred to domestic hogs. Feral hogs are the descents from introductions of European wild hogs for sporting purposes, a couple hundred years ago and from escaped domestic swine that have established feral populations. European wild hogs have several distinguishing characteristics that set them apart from domestic hogs. Among these are brown to blackish brown color, with grizzled guard hairs, a mane of hair that sticks up sort of like a wire brush running from the neck to the rump, a straight heavily tufted tail, and ears covered with hair. Characteristics of feral hogs are varied, depending upon the breed of the ancestral stock. 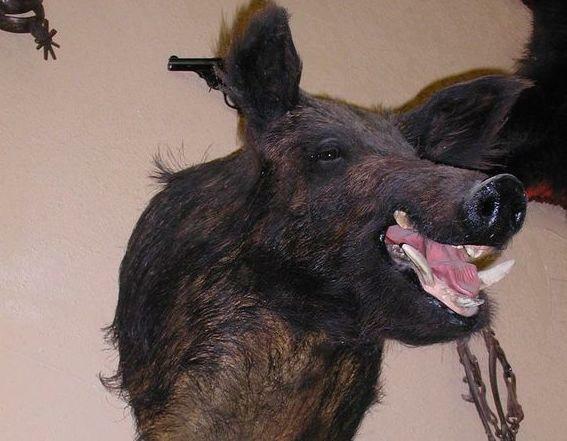 European wild hogs and feral hogs interbreed readily, with traits of European wild hogs apparently being dominant because many feral hogs look very similar to the wild boars of Europe. Feral hogs have really become a nuisance in our great state and range just about anywhere you want to look for them from the southeast coast on west through Texas. A good feral hog habitat is timbered areas. Hogs are also fond of marsh and grass-sedge flats in coastal areas, particularly if wild grapes are common. When it comes to diet feral hogs are not too picky although the biologists claim they have favorites. I have not seen much that they will not eat and animal matter on the menu of feral hogs includes earthworms, marsh fly larvae, leopard frogs, snakes, and rodents. The snakes they eat include cottonmouth water moccasins and rattle snakes and the venom does not seem to bother them. Feral hogs have negative influences on wildlife and plants as well as domestic crops and livestock. Extensive destruction is a common result of their rooting habits. They can tear up a nice yard or hay field rapidly and ask any hunter who sets out a feeder that throws corn to attract deer about how the hogs will run the deer off and eat all of the corn and will also tip over the feeder if it is not securely anchored. Clayton Wolf, who was at the time the big game director for the Texas Parks and Wildlife Department, told me the story of a man that had just purchased some land and would like to have put a few feral hogs on it to hunt and was that possible and he stipulated he only wanted a few. Clayton told the man that you either have hogs or you do not. If you have any hogs you have too many as feral hogs breed year round. Litters range from one to seven, averaging two per sow and an average of one to three suckling hogs usually accompanies brood sows. Now let me tell you a couple things you do not want to do concerning feral hogs. One is you do not want to get between a sow and her piglets because she may think you are danger to them and you will have two choices: shoot her or climb a tree because a mad sow is a very dangerous animal. The other problem that can come from an encounter with feral hogs is if a boar decides he does not like you or where you happen to be standing. There can be no understanding why but if they take it in their heads that they want a piece of you, you are faced with the same two choices, shoot it or climb a tree. If you ever run on feral hogs and they either disappear from view or you have to shoot one do not forget about the rest of the herd and watch your back because some others may decide to attack rather than run, you just never can tell which they will do.